Welcome to the bustling city of Cairo. Your journey begins as you are met at the airport and transferred to your hotel. 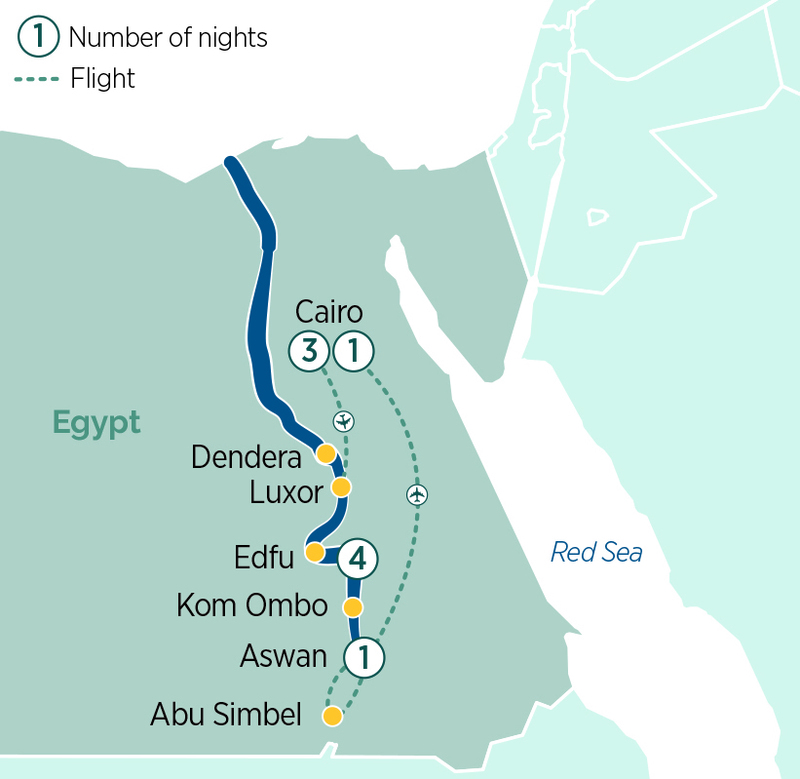 Included is a three-night stay in Cairo. Be awed by the sheer magnitude of the Pyramids before marvelling at the 20-metre limestone monolith of the Sphinx. This morning you will discover the priceless antiquities in the Egyptian Museum including the artefacts recovered from Tutankhamun’s tomb as part of your included tour. Continue to be amazed, as we take you to visit one of the most fascinating and ancient markets in Cairo, the Khan-El-Khalil market. This colourful market has stocks of everything from soap powder to semiprecious stones. In your free time, perhaps explore the Fortress of Babylon. Today, you will fly to Luxor where you will have a chance to visit the West Bank of the Nile and be astounded by the well-preserved, colourful hieroglyphics adorning the tombs in the Valley of the Kings. You will begin your journey in Luxor with a visit to the Monument of Queen Hatshepsut, and statues of the Colossi of Memnon. Then, embark on your cruise ship privately chartered for Emerald Waterways and settle into your cabin. Later, visit the vast open-air temple complex of Karnak and be awed by the enormity of the pillars as you walk through the impressive Hypostyle Hall. Relax on one of the Sun Decks and catch a glimpse of daily life along the banks of the Nile as you cruise to Dendera. Once in Dendera, you will have a chance to marvel at the vibrant colours of the hieroglyphics adorning the roof of the Hathor’s Temple during your included visit. Return to Luxor and tour the temple complex of Luxor straddling the banks of the Nile. This evening, on board entertainment will delight with the colours of the whirling dervishes and the mesmerizing moves of a belly dancer. Follow the course of the ancient Pharaohs’ processions along the Nile as you cruise south, where villages and majestic temples line the banks of the river against the backdrop of the desert. Discover the Temple of Horus at Edfu, the most completely preserved complex in Egypt. This afternoon, explore Kom Ombo temple, perched high on the east bank and dedicated to Sobek, the crocodile god. A fun night awaits on board with a lively Galabeyya party themed with Egyptian delicacies, music and dancing. Cruise south to reach charming Aswan, the home of the Nubian people. Discover the Osiris temple complex of Philae, then visit the stone quarries to learn about ancient carving techniques and see the enormous unfinished obelisk. This afternoon, take a Felucca cruise on the Nile (weather dependent). Tonight, join the Captain and crew for a farewell Gala Dinner, followed by a Nubian show. This morning, bid farewell to your crew as you disembark your ship. You will fly to Abu Simbel and visit one of Egypt’s most magnificent monuments. Marvel at the enormous World Heritage-listed temples of Ramses II and his wife Nefertari, rescued from the rising waters of the Aswan Dam. Return to Aswan where you will spend one-night. Start your day with a visit to a traditional Nubian village. Meet the school children and learn about life on an island in the Nile. In the afternoon, you will fly to Cairo, then join your tour director for a farewell dinner. Included is a one-night stay in Cairo. After breakfast, you will be transferred to Cairo International Airport for your onward or homebound flight.